Time flies when you’re having fun! It was the Spring equinox yesterday, and with one more week to go until the end of term, this week’s blog is taking a look at arrangements for the Easter vacation, help for those of you still looking for private housing, and a reminder about how you can share your views about your time living in our residences. 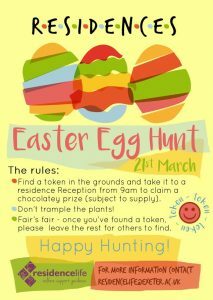 If you are reading this blog on Thursday 21 March then did you know there is an Easter Egg Hunt taking place in all our residences today?! It is completely free to take part in this annual tradition organised by the Residence Life team; just look for a red token within the grounds of the residence and take it to a residence reception to claim a chocolatey prize (subject to supply). Play fair with your fellow residents – once you have found a token please leave any others you spot for someone else to find! Those of you living in our residences will have been emailed a “Moving Out” newsletter within the past couple of weeks, which contained some essential information about end of term arrangements in the residences. For those of you in self-catered accommodation who are going away for Easter, you can take a look at our dedicated “Moving out of self-catered” webpage for useful advice. If you are in catered accommodation then your contract ends at 10am on Saturday 30 March and you must have returned your room key/fob to your residence reception by this time. Residents of Holland Hall should also know that they need to remove all items from their rooms. Catered students can look at the dedicated “moving out of catered” webpage for futher details. If you are currently living in catered accommodation but would like to stay in Exeter over the Easter break then we do have some self-catered accommodation available. The minimum stay is 4 weeks and the locations are likely to be off-campus but why not take the opportunity to explore our beautiful county? To enquire or book, come and see us at one of our Accommodation drop-in sessions in the Forum; Monday to Friday 11am-3pm by Thursday 28 March or call us on 0300 555 0444.
Who can I contact over Easter? For those of you staying in Exeter over the vacation, you can find out which Eat and Shop outlets will be open by visiting their webpage and filtering to view “Easter Vacation”. Our residence reception webpages have all been updated to include their times of availability over the Easter period. The Accommodation drop-in sessions will continue to run between 11am-3pm Monday to Friday until Friday 29 March. We can then be contacted via SID. Still hunting for the private housing? If you are still looking for accommodation in the city for September then there are still plenty of options available. We have lots of information about your options and what you need to consider when looking for housing after your first year on our Accommodation webpages. Don’t forget about Studentpad too – this is our University administered, free-to-use accommodation search portal. This morning we had 69 live adverts showing availability for September. If you want to join a new group of flatmates, or need someone to fill a room in a house you have already found, then you can post a message on the Studentpad Message Board. Happy hunting! Our Student Living Experience questionnaire closes tomorrow (22 March) and your feedback is really important to us. As an extra incentive, completed and submitted responses will be entered into a draw to win one of three £50.00 Amazon vouchers. Why not take the few minutes to complete it while you eat your Easter Egg Hunt prize?! Next week will be our final blog for term 2 and will include some important safety reminders and a look ahead at summer accommodation options. This entry was posted in 2018/19, Accommodation Office, Catered, Current residents, Drop-in sessions, Easter, Housing, Moving out, Postgraduate, Private housing, Residence Life Teams, Residences, Self catered, SID, studentpad, Uncategorized, Undergraduate and tagged 2018/19, accommodation office, catered, drop in sessions, events, moving out, postgraduate, residence life, self catered, what's going on. Bookmark the permalink.